A few months ago Steve Gillmor and I discussed bringing together key people we knew who were building, designing and innovating around mobile notifications for a half day meeting. The meeting or summit — as we ended up calling it — took place on October 1st. We had about 50 people in attendance here at betaworks, it ran half the day. 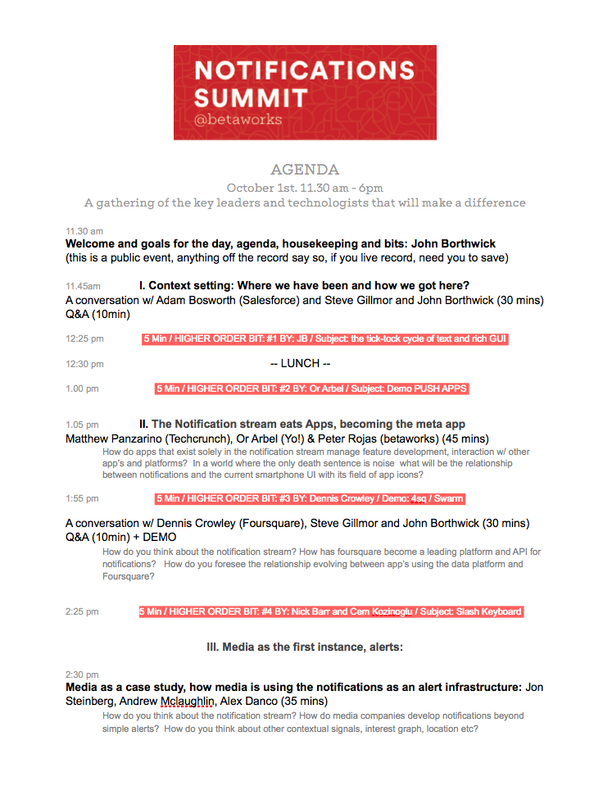 The attendee list is here, and the agenda is below. We broadcasted live video of the sessions on TechCrunch — the recorded video is posted here. I wrote up my notes about the meeting this past weekend to organize my thinking — I included most of them here, with some color. And Steve just posted his liner notes. I think about the computing industry moving through a tick-tock cycle from programable textual interfaces to rich graphical visual interface. From command line or DOS to Win95 — from the early textual web to flash and rich web GUI — and now from the field of apps on your homescreen to the notifications interface. This tick tock cycle generates cycles of bundling and unbundling as functionality that is needed in the new textual, primary layer is extracted from the rich GUI bundle beneath it. Right now we are witnessing another round of unbundling as the notification screen becomes the primary interface for mobile computing. It’s easy to get fixated with notifications as a feature — they are a feature for an app. But they are also part of this broader unbundling cycle and they are part of an architectural shift from pull to a push. It’s an interesting time. Apps and the attention they garner are lapping the web - yet we have too much signal and a lot of noise, discovery isn't solved. Tracking in real time is siloed and understanding this new layer of interaction, this shift from pull to push and how to make sense of the signal and manage the noise is why we orchestrated this event. Adam Bosworth kicked off the day with a discussion of how the notification stream represents complete re-construction of internet and HTTP from pull to push. This shift was predicted for a while but now it’s driving our primary mobile compute experience — it’s there in our pockets or on our wrist, in the form of alerts, content or service notifications. Or it’s contained or siloed in messaging and social apps that we have permissioned to be our primary stream — regardless, they are pumping a real time, torrent of notifications seeking to gain our attention. It’s sometimes brilliant and oftentimes overwhelming. The scale of this change is easy to dismiss. The simplest form of notification you get on your phone a news alert. It’s content. Sometimes it’s information, and it doesn’t even require a click. Sometimes it begs for a dive deeper. I get them all the time — my filtering weapon of choice is Digg Deeper. It gives me real time alert of whenever something is getting swarmed by my follow graph — this results in 3–7 alerts per day. I read them and either dismiss them with a thank you — or I swipe left to read the full story later in Instapaper. That’s my flow for content alerts. I’m sure you have yours but as Adam discussed with precision it’s evident that while content — media — is the first contender for attention in the notification stream — services will be the next, and likely the more powerful. Seeing notifications as an instance of this new push architecture opens up a different perspective. This isn't about news alerts — it’s much broader — imagine if you never had to “go” to anything on your phone — if everything came to you — present in your primary screen or stream of interaction. What is the lock screen? We talked extensively throughout the day about the notifications and the lock screen of your phone. With iOS9 Apple introduced a set of simple yet powerful changes. Reverse chronological ordering of notifications transforms a messy category based interface that suggested bundles of alerts into a stream. We discussed how app architecture is changing — what is an app is up for grabs, and is how Apple is gating search, how deep links can be used and what are the limits of local device search index. This mapped to the conversation Linden Tibbets, John Milinovich and Josh Elman had later in the day. Something that I hadn’t thought much about prior to this discussion was that little back button that you now have in apps iOS9. It’s useful — it helps you manage context in the same way widgets do, yet — it also reminds us of the browser — it makes using apps more of a browsing like experience. Back buttons — links — the ground around the container, for the app metaphor continues to shift. This conversation of the lock screen started with Matthew Panzarino, Or Arbel, and Peter Rojas and the discussion went straight though a discussion of media, devices, motes and contextual data with Robert Scoble, Steve Cheney and Joe Stump to the last section of the day on bots with Naveen Selvadurai, April Underwood and Ben Brown. We talked at length about what constitutes an effective notification. On one end of the spectrum content and media people argued that a notification is an opportunity to alert people of breaking news and bring some of those people into their app. For them a notification is about tuning personalization and making it contextually relevant for users thus maximizing the likelihood of an app view. On the other end of the spectrum we had a strong service based argument that notifications should resolve ambiguity and be actionable — a successful notification is one you don’t need to travel to the app to complete. It comes to you and is actionable inline. The discussion between Jon Steinberg, Andrew McLaughlin Stacy-marie Ishmael, Alex Danco and Zach Seward was fascinating. I liked the framing of a notification as “a question that a computer is asking you”. This is how Alex and his colleague framed it in a podcast they did a week prior to the event. Thinking about notifications this way opens up the possibility set for me. Pushbutton and the role of the platforms? Whether you are riding on Apple’s platform, Facebook’s, Google’s or Tencent’s, in mobile it’s platforms most of the way up and down. And platforms have varying degree of control of the notification layer. I see this time as reminiscent of the early days of the real time web and Twitter. There was a window where it seemed Twitter could become a universal messaging bus for media and for services, a notification bus. In 2009 Anil Dash wrote about the PushbuttonWeb he flagged two areas of concern — control by centralized platforms and poor user experiences — he got the issues right what he missed was the primacy of mobile, of services, and how the push internet would need to wait for you to have a computer in your pocket that was always connected. I think it was hard to see back then how Twitter would focus on media. Platform risk and platform dependencies underpinned much of the discussion — it was the elephant in the room — Steve and I had planned to do a wrap up session with Om Malik and Matt Mullenweg yet the last discussion (on bots) ran late —we let it run way past its time, it was that good. The wrap session is going to happen in ten days or so. I look forward to it. We discussed event detection and Gilad Lotan spoke about what constitutes a signal and different approaches to capturing and triggering a notification. The discussion with Dennis Crowley and his slides dominated this part of the day for me. I left the meeting with a much more interesting and expansive view of what Foursquare is and what it could be than I have ever had. Dennis was great — for a snapshot of what he discussed take a read of this Quora post by Andrew Hogue answering the question “How does Foursquare’s presence system work”? Over the course of several discussions the room came back to the question of filters. This question is closely related to the platform one — it’s likely that the platforms will provide the algorithmic filters that tune our notification stream. Google did it for search, Facebook did it for the news feed and it’s likely that Apple will algorithmic filter the reverse chronological notification stream. Will there be companies built on notification optimization the way businesses were built on search or on social optimization? And is it a signal that notification optimization spells NO, or is it merely a coincidence? We talked a bunch about bots. We were fortunate enough to have April and Ben discuss Slack bots in details — Ben demo’d an alpha bot from XoXco and Naveen pushed them and the room to really dig into some fascinating questions around bots. Assume you can build an invisible app — one that beyond basic permissions lives in the notification layer - what does that look like, what interactions can you have with it and how does this become indistinguishable from bots? A point of disclosure here — as you can see from the agenda below we did set things up this way. The narrative formed a path from media to services to bots and programable textual interactions but Naveen, April, Ben, Peter and the room got it there in a way I couldn't have imagined. Ben dug into bot interfaces — how navigation works and doesn't with bots — and we touched on gender politics in bots. And Peter told us about how Google now went astray for him — confused him with another Google user and started pushing messages to him that he was late for a flight to Europe when in fact he had no plans to go to Europe at all. The event went better than I could have expected. Great discussion, great people — I learnt a lot. 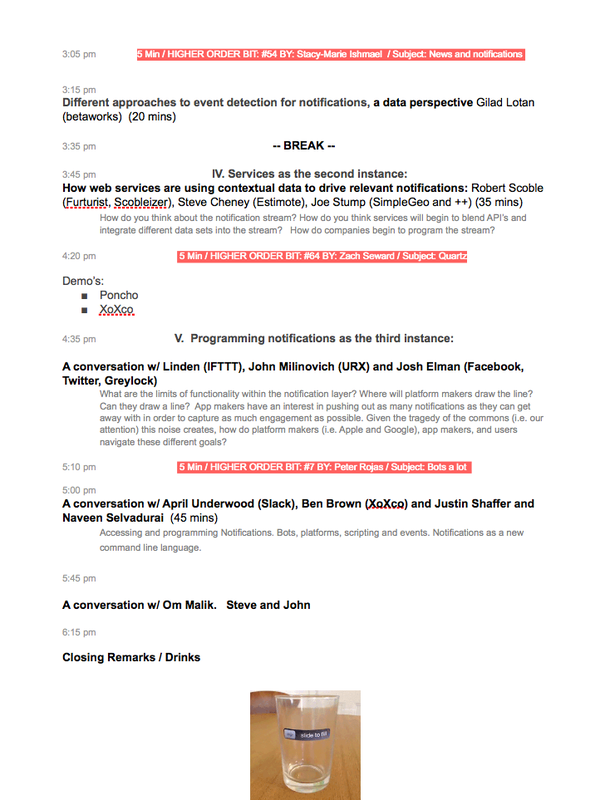 Organizing and participating in events like this is something we have done for years at betaworks — I view it as part of a bootstrap — a process of bringing together a community of builders, to coalesce thinking around a particular area. I hope the video and the slack channel will distribute some of the thinking and ideas and open up a broader discussion about notifications and the push internet. Thank you to Steve for co-hosting the event. Thank you to the participants and thank you to the organizers of the event. Eli Portnoy: Where Are The Invisible Apps? Alex Danco: Notifications run our lives now. Is there room for any more?